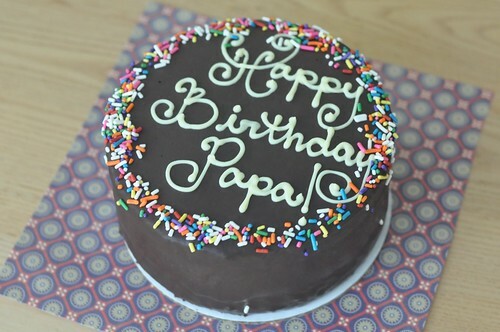 Blondie and Brownie: Happy Birthday Papa Brownie! Thanks to Facebook, I recently discovered Scratch Baking Co in Portland, Maine and I've been dying to check it out. A Facebook friend recently posted about the virtues of their cake so with my dad's birthday celebration on the line, I knew I had to pay them a visit. Coming from New York I was excited/thrilled/overjoyed to see that the small cake, a 6 incher that feeds 4 to 6 was only $15. I picked the Ring Ding Cake*, a chocolate cake with whoopie pie filling and chocolate ganache, because it sounded kind of like a Bumpy Cake with the bumps on the inside. Plus one to Scratch Baking for the lovely piping personalization. The cake itself was super moist and very chocolatey. The filling was perhaps more buttery than I'm used to in a whoopie pie (I'm an old school purist when it comes to whoopie filling, give me sugary Crisco goodness any day), it was rich and creamy. Between five of us we only got through half a cake, which left cake for breakfast on my dad's actual birthday (today!). By the time you read this I will likely already be on my second (or third slice). Feel free to join me in raising a glass to my dear dad. Happy Birthday! *According to their site, Scratch Baking Co requires a minimum of 48 hours notice for cakes and when I spoke to the woman on the phone she mentioned checking the "cake schedule," I assume they limit the number of cakes they make on a given day, so plan accordingly!